No Responses to "soursop graviola"
Fast delivery, still frozen when product arrived, very happy, delicious juice pulp. We hope you enjoy the soursop. Please purchase form our online store on this site. 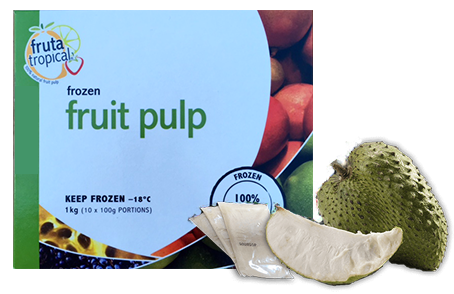 We only sell frozen soursop fruit as the fresh fruit has a shelf life of about 3 days, so frozen is a better way to buy the fruit. Hi i am a farmer in Mareeba FNQ and am looking for new crops an i know soursops grows well here i wonder if you would be kind enough to tell me what you pay for your fruit. I’ll email you my reply. We only deliver frozen soursop and it’s delivered frozen to your door. We have our soursop fruit delivered frozen directly from our supplier in Sydney so you would need to order first and then they will deliver to your door, but deliveries do not restart until January 5th 2018. Hope this helps. Depending on what you need the fruit for you can use the leaves or teabags as they are almost twice as strong as the fruit. Hi like to get same to can you tell me the price please thanks. All the prices and quantity details are on the website. I live in South Australia can you deliver frozen soursop here? I’m having trouble getting it in SA for my husband who has terminal stage 4 brain cancer. He’s had two removals (last in October 2017) and now on double chemo which is holding it. Or do you know anyone in SA that sells it fresh / frozen? Did you get the email I sent over the weekend? If not please let me know as this explains a few things you need to know. Am after soursop fruit before saturday. My uncle aunty from sydney is desperately after one. Unfortunately, our supplier only delivers 3 days per week and the earliest you would get it would be Monday or Tuesday next week. You can order it from us and we can get it delivered to your address. I don’t know of any other places that have frozen soursop in Sydney. Hello my name is ofelia alonzo i lived in Darwin NT Australia i am a pensioner how i can order sour fruits? Please let me know because i just have an operation of breast cancer . If you have just had an operation to remove cancer then your best option is to have the tea either in leaf form or teabags as the leaves are almost twice as strong as the fruit. Unfortunately, our supplier doesn’t deliver to NT so this would be a better option for you. Please go to https://soursopleaves.com.au and you can then order from there, but if you have any issues please let me know and I’ll help you. Both the teabags and leaves have instructions on the back of the pack plus there are comprehensive instructions on the website. I have been advised by my brother to buy soursop tea for my Dad. He has got Lung Cancer and will go through treatment shortly. We have heard that soursop tea is good for cancer patient, has not side-effects and can be used side by side with regular treatment. I would like to know about the delivery time. I live in Sydney and i am flying to Singapore in a week. Is it possible to get the delivery within next week ? Also, are there instructions on how to prepare the tea ? That’s no problem. If you order today we can send it tomorrow and you should have it this week. Best to use Express post as you will get it quicker. Currently, we don’t but that is because there is nothing that we have found on the market that has little or no sugar in it. If we could find a supplier that provided sugar-free soursop juice we would gladly look into it but at this stage, there is nothing. Hi, I am looking to buy fresh soursop fruit for myself and two other families. I live in Sydney on the north shore. Could you please advise where I can buy this fresh fruit? I am unsure about the fresh fruit at this time of the year as it’s not in season now. I have heard you can get it from Cabramatta market but only when it’s in season. Hi , if we ordered the tea and frozen fruit, how often should they drink the tea or make a smoothie? Is it okay to have with chemotherapy? What days do you deliver to Elsternwick? Firstly, the tea or fruit is ok to have with chemo. The fruit you can have daily but do take a break for 5 days each 30 days, whereas with the tea you need to take a 10 day break every 30 days because its stronger than the fruit. Delivery to Elsternwick can be done Mon-Wed.
My aunty has been diagnosed with pancreatic cancer and I’m interested in purchasing your sour sop frozen fruit. © 2019 Soursop Australia - All Rights Reserved.